Let's be honest here. 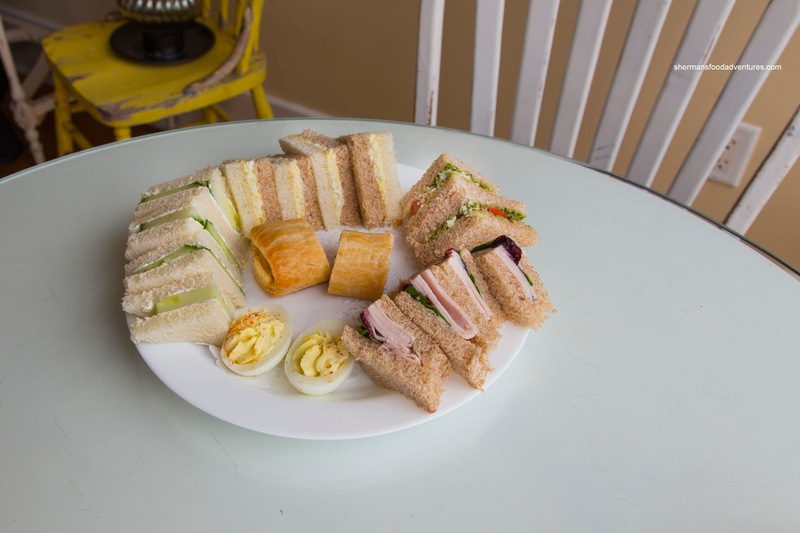 High tea or afternoon tea is not generally frequented by dads. More often than not, we see a bunch of girlfriends or mom and daughter sipping tea while snacking on scones. Yet, that shouldn't be the case. If moms can enjoy this on Mother's Day or really any other day, Dads should be able to get in on the action too! I've always lobbied for "Man Tea" where we would find 3 tiers of appies such as hot wings, dry ribs and potato skins served with beer. 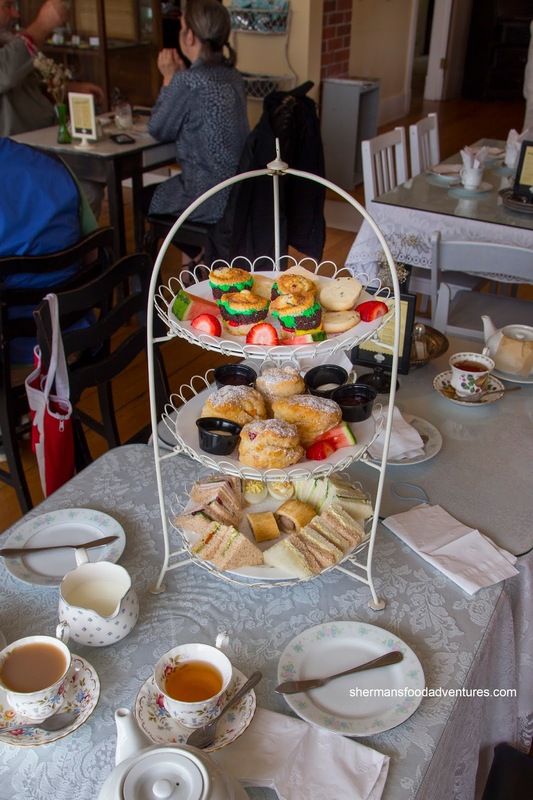 That doesn't exist, but for now TracyCakes is offering a "Dad & Me High Tea" on June 17th and 18th for $20.00pp that consists of the usual (such as finger sandwiches and scones) with the addition of deviled eggs, sausage rolls and cupcake "burgers" with a side of yes... beer. I was recently invited to give this a try along with the family. 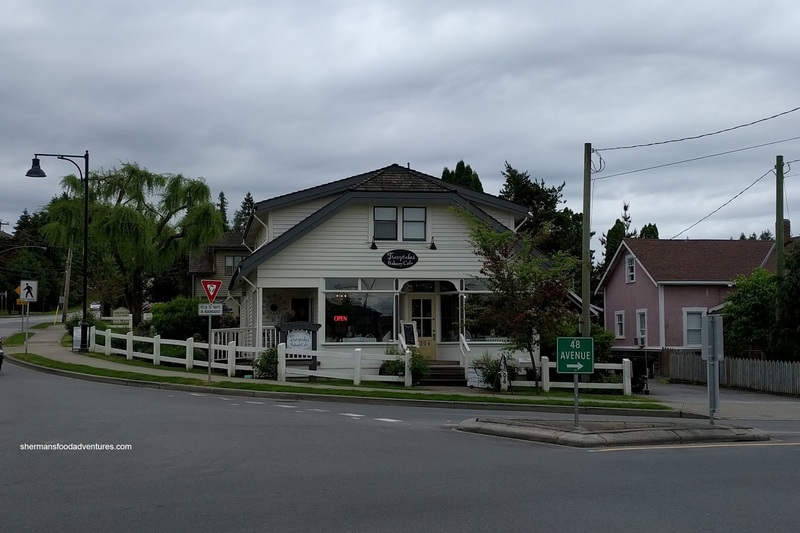 We decided to hit up the Langley location on 48th at 216th. There is also another store in Abbotsford as well. Housed in a building that dates back to 1932, both the outside and inside were quaint and nostalgic. Tastefully decorated, the dining room was filled with natural light. It was a peaceful environment where we could watch all the cars circle the roundabout in front from the 5 corners. Now I never did have a beer, rather I stuck with the usual tea in the Tropical Green Tea. This was actually quite mild with a hint of fruit flavours that blended well with the light green tea. Usually, green tea can exhibit some bitterness, but this was smooth. 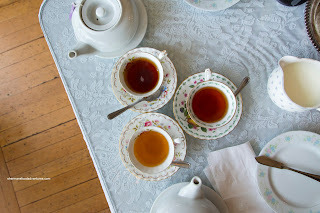 Viv decided on the Vanilla Tea which was predictably aromatic. There was no mistaking the flavour and it was even more impactful with the addition of some sugar. My daughter chose the Very Berry and it was more floral than we would've expected. Rather than berries, it tasted more like aromatic flowers. Onto the actual goodies, we tackled the bottom tier first. There was an array of Sandwiches that consisted of cucumber and cream cheese with dill, egg salad, pesto tomato and turkey with cranberry and spinach. We found the bread to be fresh and soft while the pesto tomato was the most impactful. Also on the plate was a sausage roll and deviled eggs. The egg was quite good where the whites were not rubbery while the yolk was creamy and light. It was mildly salted with a hint of mustard. We moved onto the 2nd tier consisting of 2 types of Scones. One was made with peaches and the other with strawberry. They came with the requisite strawberry jam and Devonshire cream. These were abnormally large where none of us actually finished an entire one. They were pretty typical being slightly heavy, but still moist and tender (not wet though, even with the fruit). It wasn't particularly crumbly though. 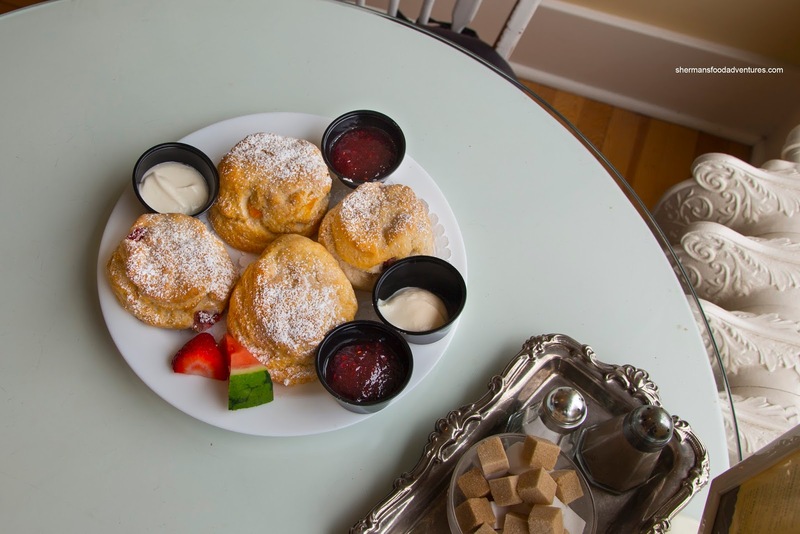 There was a minimal amount of fruit which was probably intentional as the moisture content would make the scone wet. 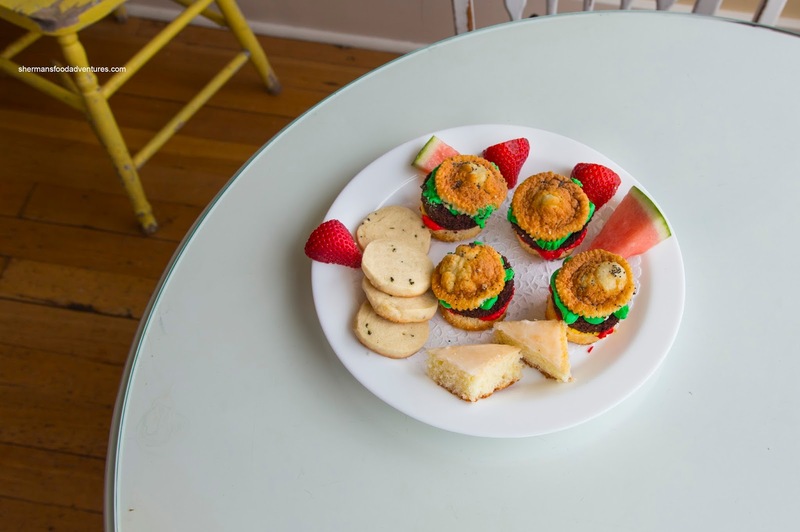 The last plate of goodies consisted of Cupcake "Burgers" with coloured frosting emulating mustard, ketchup and lettuce. These were moist and not as sweet as they appeared. We also found sugar vanilla cookies and lemon glazed cake as well. I enjoyed the sweet, yet lemony glaze on the cake as it almost seemed light because of it. We never did finish all of the cake and the cupcakes because there was more than enough for the 4 of us. We also had 1.5 scones left too. Definitely a good value for $20.00pp and loved how they are marketing it for Father's Day.